Within the framework of Europeana Space a number of hackathons are organised to develop tools for using Europeana content. The Hacking Culture Bootcamp hackathon, held in Amsterdam between May 8 and May 10 this year, focused on creating multiscreen experiences with digitalized historical footage from Europeana. In the hackathon seven teams of participants from different backgrounds created new multiscreen digital tools to engage with cultural heritage. For EUscreenXL we participated with a team of six. The kick-off consisted of a debate in which experts and the public talked about media strategies and the potential of cross-media for broadcasters and museums. It included presentations by Rutger Verhoeven (BNN-VARA), Wilko van Iperen (KRO-NCRV), Jane Finnis (Culture 24) and Simon Cronshaw (REMIX Summits), who shared their expertise and experiences. They provided examples of how people could be persuaded to engage more deeply with cultural heritage. We, the EUscreenXL team, consisting of two developers, two designers and content-experts, decided to connect the multi-screen dimension to the work developed for the publication tool for EUcreen.eu while focusing on a classroom setting. 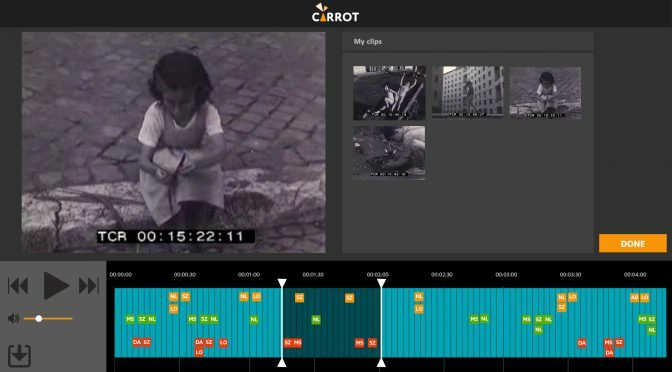 We developed The Carrot: a tool to collaboratively view, discuss, comment on, and tag videos related to a specific topic and subsequently to extract clips and produce video posters as a final assignment. The Carrot integrates multiscreen elements using content from the EUscreen portal. This is how The Carrot works: While watching a video on a main screen, students tag this video using their own mobile devices. This collaborative interaction with video content will ultimately stimulate discussion and participation, enhancing students’ engagement with audiovisual cultural heritage. Following discussion of the tagged scenes, students select and make clips and subsequently design and create video posters, in which they combine video clips with text, thus creating a rich argument about the material. The Carrot allows teachers to adopt contemporary media didactics and to make students from different levels interact with audiovisual cultural heritage. It allows for enriching archive collections in the process. The Carrot has potential for students at various levels as well as for different video collections and working environments. After an exhausting but fun three day’s work we presented the Carrot in a 5 minute pitch to a jury and the audience. Even though The Carrot did not win, it received a lot of positive feedback. We are looking forward to seeing The Carrot tool implemented as part of the EUscreen portal. The Carrot team consists of: Mariana Salgado (Aalto University- EUScreenXL), Sebastian Zelonka (independent developer and designer), Willemien Sanders (UU- EUScreenXL), David Ammeraal (Noterik- EUScreenXL), Neea Laakso (Aalto University- Europeana Creative), and Laura Osswald (UU-intern at EUScreenXL). With special thanks to Marco Rendina (EUScreenXL-E-Space).